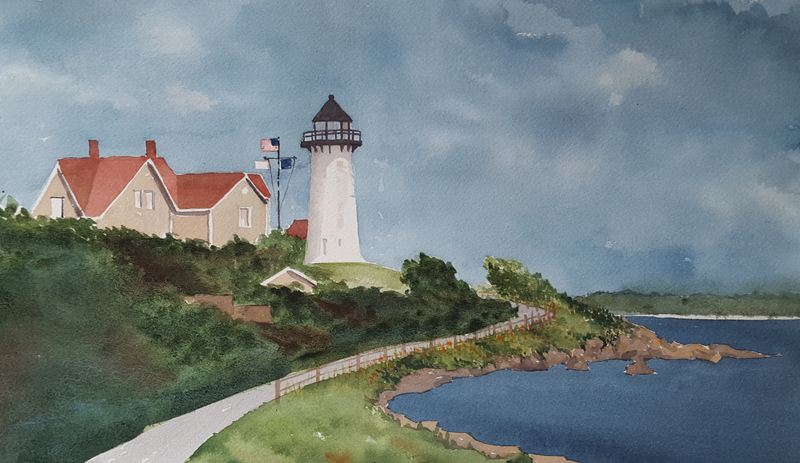 Located at the mouth of the Taunton River, Borden Flats Lighthouse has protected the waters of Mt. Hope Bay and Fall River for well over a century. During the early days of the industrial revolution, Fall River became known as the world leader in textile productions. The city grew to employ nearly 30,000 textile factory workers and became destination for large steam liners from destination such as Boston and New York. Due to a large under water reef at the entrance to the Taunton River, a lighted day marker was places atop the obstacle, only to prove obsolete for night commerce. Congress appropriated funds for the construction of the cast iron, “spark plug” style lighthouse. On October, 1 1881 the lighthouse became active with a fixed red light from a 5th order Fresnel Lens. The lens was later upgraded to a 4th Order Fresnel Lens. Pilot Falcon fountain pen with Noodler’s black ink and Pelikan watercolors in a Stillman and Birn sketchbook. Another trip to New Jersey for business. Sea Girt Lighthouse in Sea Girt, New Jersey, flashed its first light December 10, 1896. The beacon, which could be seen 15 miles at sea, guided countless mariners in their journeys and contributed to the state’s economic growth and helped make sailing through local waters safer. 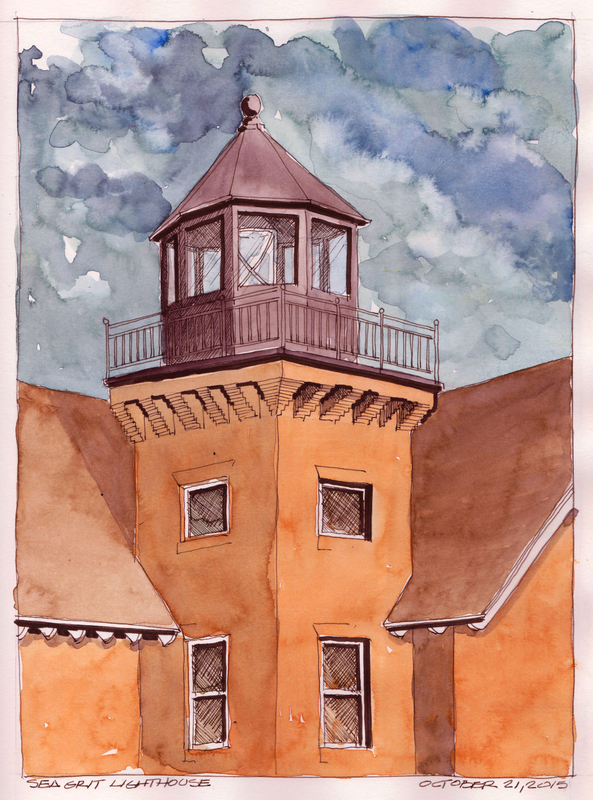 The lighthouse was built to illuminate a blind spot midway in the 38½-mile stretch between Navesink Lighthouse (Twin Lights) to the north and Barnegat Lighthouse to the south. It also served as a landmark for nearby Sea Girt Inlet and Wreck Pond. The red brick structure with a tower rising 44 feet was the last live-in lighthouse built on the Atlantic Coast. A live-in lighthouse has the tower integrated into the living quarters. Sea Girt was equipped with a fourth order Fresnel lens, which was 30 inches high. The multi-sided beehive-shape lens had a bulls-eye prism like a big magnifying glass in the middle of each side. Lamy Fountain Pen with Noodler’s black ink and Pelikan watercolors in a Stillman and Birn sketchbook. 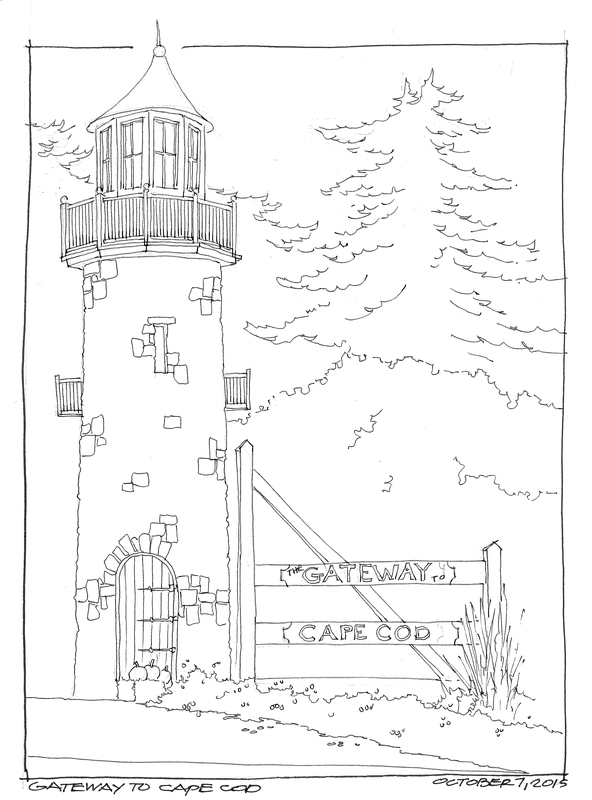 A quick ink sketch of the Gateway to Cape Cod. This monument is located on Route 28 as it enters Wareham, MA and is paired with a similar one on the other side of the street that says Wareham, Massachusetts, Incorporated 1739. Wareham is often considered the gateway to the cape in that it is the last town on the mainland before crossing the bridges to the cape. Lamy fountain pen with Noodler’s Black Ink in a Stillman and Birn sketchbook. 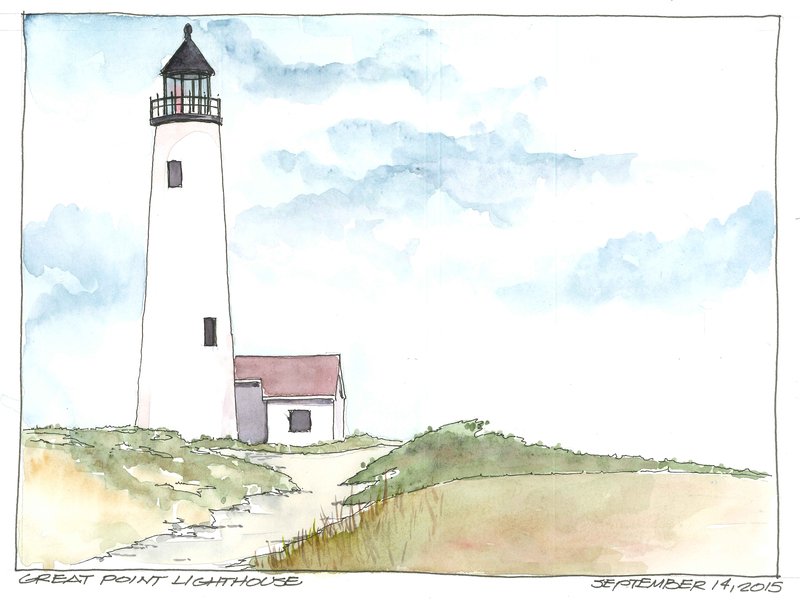 Great Point Light, officially, Nantucket Light is a lighthouse located on the northernmost point of Nantucket Island. First built in 1784, the original wooden tower was destroyed by fire in 1816. The following year a stone tower was erected which stood until toppled in a storm in March 1984. Rebuilt again in 1986, the stone tower was built to replicate the old one, and still remains in operation today. Modern additions include solar panels to recharge the light’s batteries, and a sheet pile foundation and 5-foot thick concrete mat to help withstand erosion. Faber-Castell Pitt pen with Holbein and Daniel Smith watercolors in a Stillman and Birn sketchbook. The Highland Light (previously known as Cape Cod Light is an active lighthouse on the Cape Cod National Seashore in North Truro, Massachusetts. It is the oldest and tallest lighthouse on Cape Cod. The park and lighthouse area owned by the National Park Service. The present location of the lighthouse is not the original site. It was in danger of falling down the cliff due to beach erosion, so the structure was moved 450 feet (140 m) to the west. The move was accomplished over a period of 18 days in July, 1996. Pilot Namiki Falcon fountain pen with Noodlers Black ink and Holbein watercolors in a Stillman and Birn Sketchbook. Chatham Lighthouse,known as Twin Lights prior to 1923, is a lighthouse in Chatham, Massachusetts, near the “elbow” of Cape Cod. 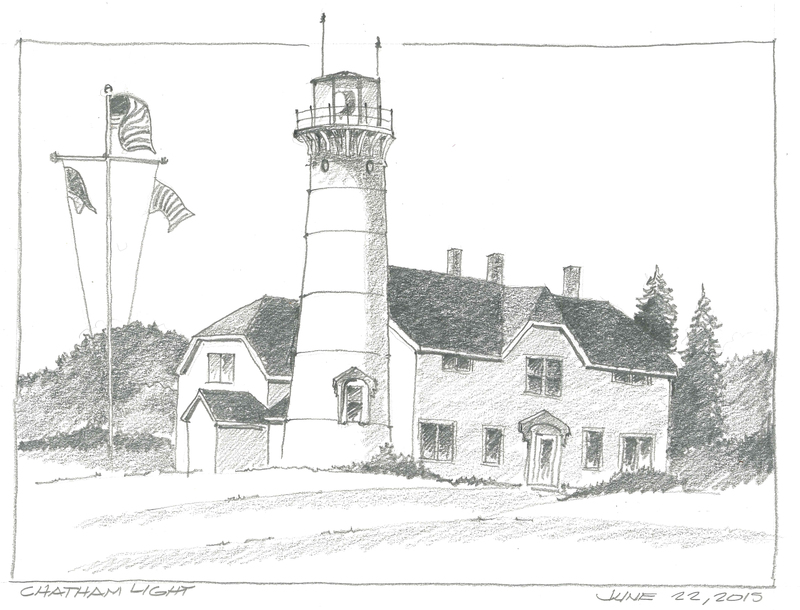 The station was established in 1808, the second light on Cape Cod. 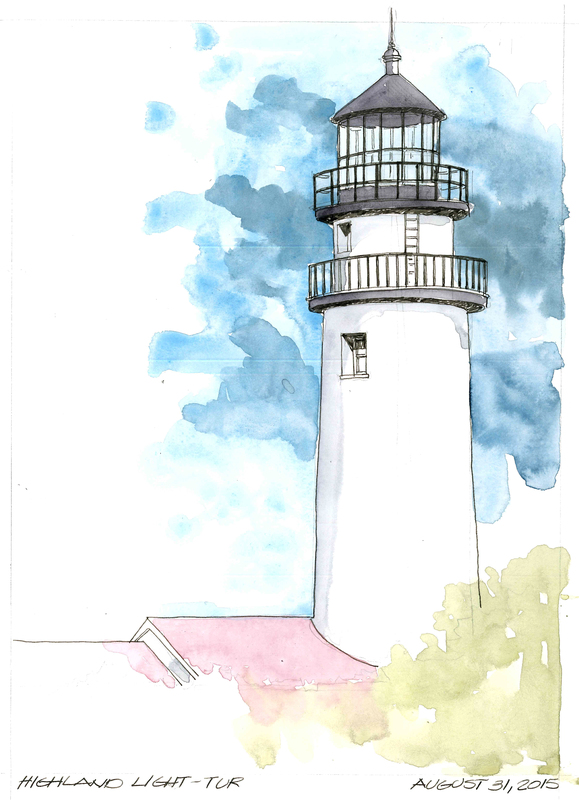 To distinguish it from Highland Light, the first Cape Cod light, and to act as a range, twin octagonal 40-foot (12 m) wooden towers were built. They were on skids so that they could be moved to keep them in line with the entrance channel as it shifted. The current structures were built in 1879 of brick lined cast iron with a Fourth Order Fresnel Lens. Today, the former keeper’s house is an active U.S. Coast Guard station, and on-duty personnel living quarters. Quick pencil sketch with Koh-I-nor solid graphite 4B pencil in the Alpha Series Stillman and Birn.